WASHINGTON, DC – The U.S. Consumer Product Safety Commission and Health Canada, in cooperation with the firm named below, today announced a voluntary recall of the following products. 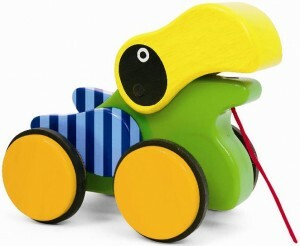 Consumers should stop using recalled products immediately unless otherwise instructed. Manufacturer: Manhattan Group LLC, of Minneapolis, Minn. Hazard: The toy has wooden components that can break or come loose, posing a choking/aspiration hazard to young children. Description: This recall involves three types of pull-toys: Pull-A-Long Friends Toucan™ with lot code 210720GB, Pull-A-Long Friends Alligator™ with lot code 210750GB, and Pull-A-Long Friends Sharky™ with lot code 210530GB. The Toucan has a large yellow and black beak and blue striped wings. 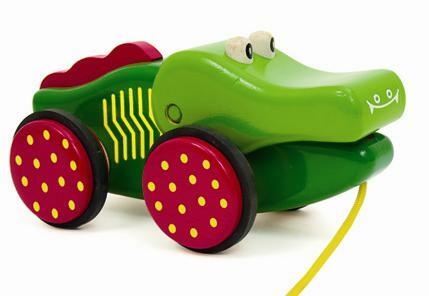 The crocodile is green and has a red ridge on its back and red wheels with yellow polka dots. 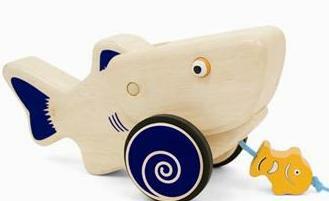 The shark has blue swirls painted on its wheels and an orange wooden fish on the pull string. The lot code is printed on the bottom of the toy. Sold at: Gift and specialty stores nationwide, online and through catalogs from September 2009 through January 2010 for about $22. Remedy: Consumers should take the toys away from young children immediately and return them to the store where purchased for a refund or a replacement toy.